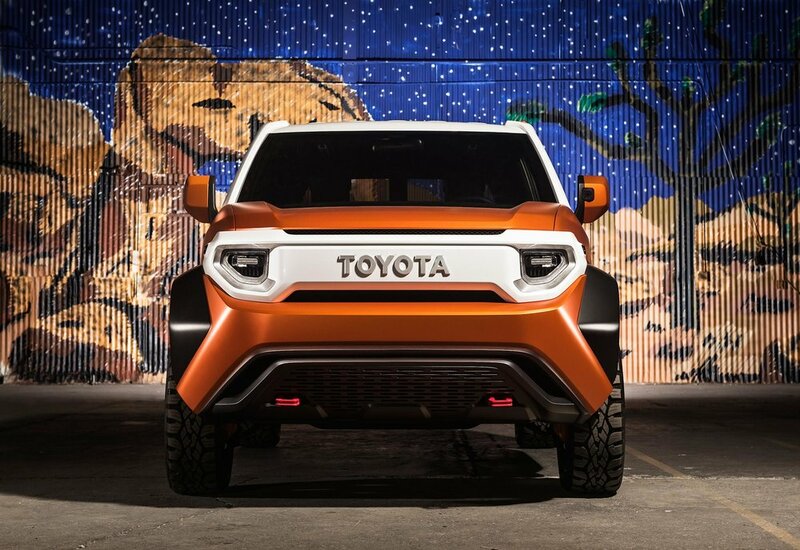 Toyota has pulled the covers off its new FT-4X Concept (Future Toyota – Four-Wheel Drive Crossover) in New York. Dubbed a four-wheel drive “toolbox,” it has been penned by Toyota’s Calty design centre in California, with its styling defined by the theme of ‘Rugged Charm’. The designers took an unconventional approach to their work, starting with the rear of the vehicle rather than its nose or profile. Toyota says this acknowledges how the target ‘Gen Y’ explorers make the tailgate or hatch of the car the centre of activity. An “X” theme is present throughout the car’s exterior, for example, a door handle is located at the centre of a vertical, bowed X, at the widest point of the vehicle. A similar bowed X shape can be seen in the rear hatch design, again with the door handle centrally located. The concept runs on 18-inch wheels and custom 225/55R18 Goodyear All-season tyres. The rear Multi-Hatch can be opened horizontally, in Urban Mode, or vertically, in Outdoor Mode. Urban Mode splits the hatch in half for easy kerbside loading when space is tight. Outdoor Mode opens the hatch upwards in one piece. A rotating handle is turned to select the opening mode, which is deep-set so that it’s easy to operate when wearing thick gloves. The flat roof is reinforced so that big items can be carried, with tie-down hoops located at each corner. Power outlets are integrated into the base of the tie-downs for use with camping or roof rack accessories. Generous approach and departure angles ensure that FT-4X can tackle both on and off-road conditions - capability that is reflected in the black-painted wheel arch mouldings, says Toyota. A vertical window above the offside rear wing pays homage to the design of Toyota’s Xtracab pick-up and original 4Runner SUV, with removable glass that can be replaced with tinted or opaque options. Sculpted rocker panels enhance underbody protection and durability when venturing off the beaten path. And whenever the FT-4X does find some heroic scenery, a GoPro HERO5 Session camera built into the driver’s side rear-view mirror can capture it all. The X theme is evident in the front design, too. An extra-large Toyota emblem is set dead-centre, flanked by LED headlamps. The horizontal orientation of the grille, headlights and bumper nods to classic Toyota FJ Cruisers and pick-up models of the past. The cabin has been conceived as a large open space fitted with easily accessible storage for all kinds of kit. Areas are colour-coded: blue for closed and orange for open storage. The inside of the hatch features two boxes, one warm, one cold, to warm or cool items as required. Toyota says the cabin is divided into three zones; Clean Zone, where the driver and front passenger sit, with rugged floor mats and sills inspired by Japanese sunoko slotted wood flooring; Wet Zone, with all-weather mats where damp or muddy kit can be stowed just behind the front seats and below the rear bench; and Rear Cargo Zone. The Rear Cargo Zone has a completely flat floor with a concealed deep storage compartment accessed by sliding the floor section towards the Rear Multi Hatch (doing this transforms the floor into a tray). An 'ultra-compact' The North Face sleeping bag fits neatly between front passenger seats, and functions as an armrest that is strapped on top of the dividing console. Clever touches abound; the interior lighting can be removed and used as a torch; the side and rear door handles can serve as ad-hoc water bottles; and the armrests are fitted with USB ports and large rotary window switches. The centre dome light can be taken out to use as a locating light or beacon. The multimedia audio system can also be removed and is designed with an extra-large handle grip. There is no traditional navigation screen; instead there is a mobile phone mount immediately above the digital instrument cluster, the thinking being that owners will download apps for both navigation and off-road instrumentation. The FT-4X has been designed potentially to run with a small-capacity four-cylinder engine. It features mechanical four-wheel drive and selectable low-range transmission. The MacPherson strut front and double wishbone rear suspension design is engineered to cope with driving over rocks and potholes.